This article was written by Peter Schwartz for Red Herring’s 02002 Scenarios issue. This is the original un-edited piece. Yucca Mountain in southern Nevada is more a ridge than a mountain. It slowly rises from a height of four thousand feet to six thousand feet along its’ length of six miles. On February 28 seven colleagues of mine from the Board and staff of The Long Now Foundation rode in an open train into one of the biggest holes in the world bored into the face of Yucca Mountain. Beginning at the north portal of a five-mile long C shaped tunnel the train carried us about a mile and half into Yucca Mt. In 1997 the 25-foot diameter borer machine emerged from the face of the mountain to open the other end of the tunnel three miles south of the north portal. For most of its length the tunnel is about a thousand feet beneath the summit of the mountain and even more important a thousand feet above the water table. 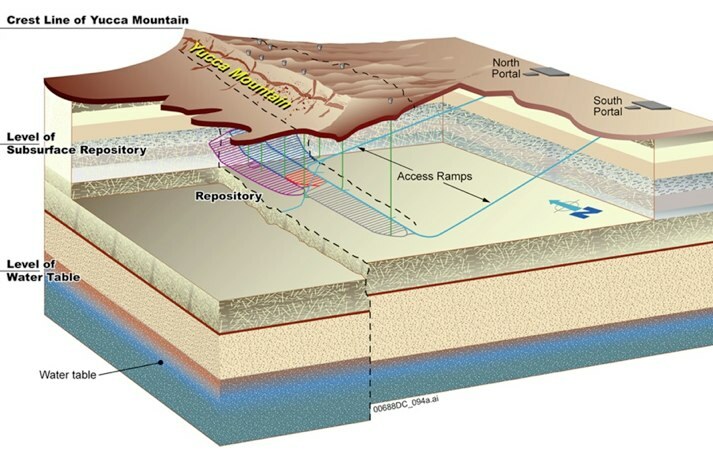 That’s important because, of course, this tunnel in Yucca Mountain is where the United States government is intending to store the nation’s high level nuclear waste for the next ten thousand years and beyond. 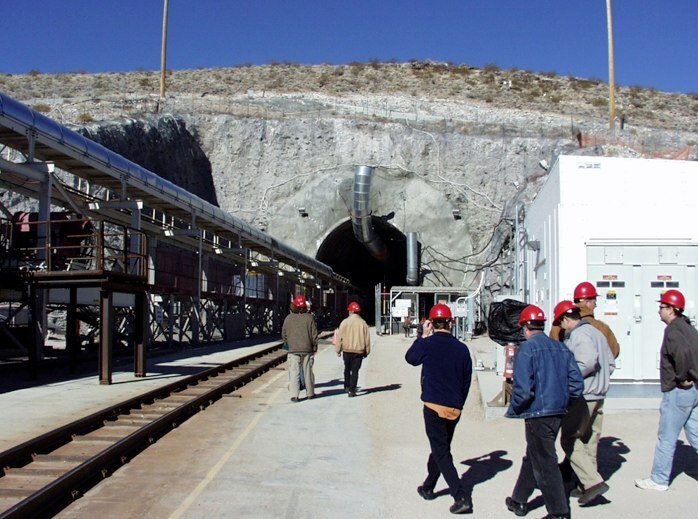 The question of the future of Yucca Mountain has become very current because on February 14, 2002 Secretary of Energy Spencer Abrams recommended the approval of Yucca Mt to the President who acted the next day to notify the Congress of his intention to go ahead. By the time you read this it is virtually certain that the Governor of Nevada will have acted to veto the project as the Nuclear Waste Policy Act of 1982 allows him to do. Congress then has 90 session days to override the governor. The issue in the Congress will undoubtedly be highly contentious in both the Republican controlled House and the Democrat controlled Senate with the outcome not predetermined. In the end it is likely that the Congress will go along with the President because no other state want’s nuclear waste in their backyards either. The more than five miles of tunnels, cross drifts and alcoves that have been drilled so far are really part of what is called the Exploratory Studies Facility. It is a research program, costing $8 billion so far, intended to prove the safety of the repository for ten thousand years. If it morphs into the actual nuclear waste site then they will bore another sixty miles of tunnels branching off the main one where they will actually store the hot waste. Deep in the tunnel we saw one of the current research projects designed to test the consequences of the heating that the sealed in nuclear waste will produce. In a tunnel branching several hundred feet off the main tunnel we found the last half sealed off. Peering through a very hot pane of glass we could see along row of huge heaters lined up back into the end of the tunnel. The heaters had raised the temperature in the tunnel to several hundred degrees over four and had just been turned off a few weeks ago for their four year cool down. What’s the urgency to get Yucca Mt on line? Today the country’s 104 nuclear plants and the nuclear weapons program have produced 40, 000 metric tons of spend fuel. By 2035 it will be two and a half times that. Most of that waste is currently stored in 33 states at a few Dept. of Energy sites and at the sites of 72 nuclear power plants in what are euphemistically called “swimming pools.” These were designed as temporary storage sites where the risks of dangerous failures are increasing over time. So something must be soon with the existing waste let alone what is to come. And even if we get started now it will be 2010 before any waste goes underground. It will take that long to build out the necessary infrastructure for handling this very nasty stuff. This is very big science and truly great engineering at the service of bad politics. At Yucca Mt we met remarkably creative people who have spent much of their working lives in very harsh conditions trying to solve one of the toughest problems we have in this country. That the problem as posed is insoluble is not their doing. Politicians on both sides of the issue, proponents and opponents of nuclear power have engaged in the politics of illusion at great cost to the American people. The opponents that cannot be realistically achieved have set a target of perfect isolation for 10,000 years. This is their way of blocking nuclear power. So the proponents in turn design a deceptive process to validate the achievement of an unattainable goal. So what are the options? We can leave them where scattered around the country in temporary facilities. This has very high risks of something wrong and no one finds it acceptable. We could recycle the fuel for reuse. So far, however, cost, its own environmental problems and most of all, the dangers of nuclear weapons proliferation, have stopped nuclear fuel reprocessing. Most current process for recycling nuclear waste yields plutonium that can be used for weapons. Or as currently planned we can store somewhere for along time. That means Yucca Mt or somewhere else. No one wants nuclear fuel around but Yucca Mt has a few advantages. 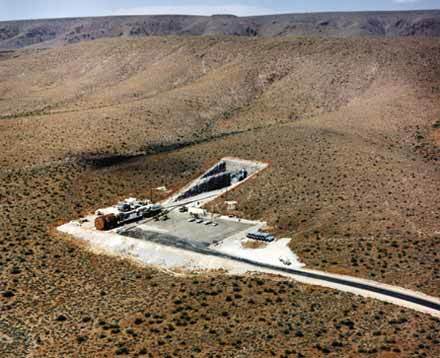 It sits at the edge of the Nevada Nuclear weapons testing site. Shortly after clearing the gate of the site if instead of turning left toward Yucca Mt we had turned right we would have encountered dozens of sites of nuclear weapons test both above ground and underground. As it was we crossed Jackass Flats where we tested a nuclear powered rocket motor in the late fifties and early sixties. This isn’t prime development real estate. Indeed some hint of the local attitude is the fact that there are two prisons on the 100-mile drive out from Las Vegas. There are several possible scenarios for the future of Yucca Mt. The opponents could successfully block it indefinitely. It is not too hard to imagine opponents lying across the railroad tracks as the nuclear waste trains make their way to Nevada. It ends up like some other federal energy related projects, never being used. Something else would have to come along, like cheap safe recycling to make this an enduring scenario. Eventually you have to clean up the local mess one way or the other. Of course, we could put the waste into Yucca Mt and remains their uneventfully for tens of thousands of years stretching on indefinitely into the future. However it is not impossible that something goes wrong relatively soon, say in the next thousand years. Perhaps the heat and the radioactivity lead to the breakdown of the storage vessels soon along with more rapid intrusion of water into the repository could lead to the poisoning of the aquifer. This would lead to big regrets. Or as I think most likely we will put it in and take it out. There is likely no better answer in the short run. But I think we will be come so concerned about the consequences of burning hydrocarbons, especially the impact on climate change that we will want to revive nuclear power. We may come to want the usable fuel buried in the waste. The technology for fuel reprocessing and for nuclear plants themselves are both likely to improve dramatically in the future. We just don’t when. There are no risk free answers. But it appears that the balance of risks and the least regrets scenario is to store the waste at Yucca Mt and invest in better re-cycling technology to create future options for our children.